Tracy and Eric are fabulous and have the convenient skill of kissing on demand. Or maybe they are just both super cooperative so when photographer says “kiss” they kiss. Eric has a knack for taking a shot to the next level and coming up with a plan for what pose to do next. 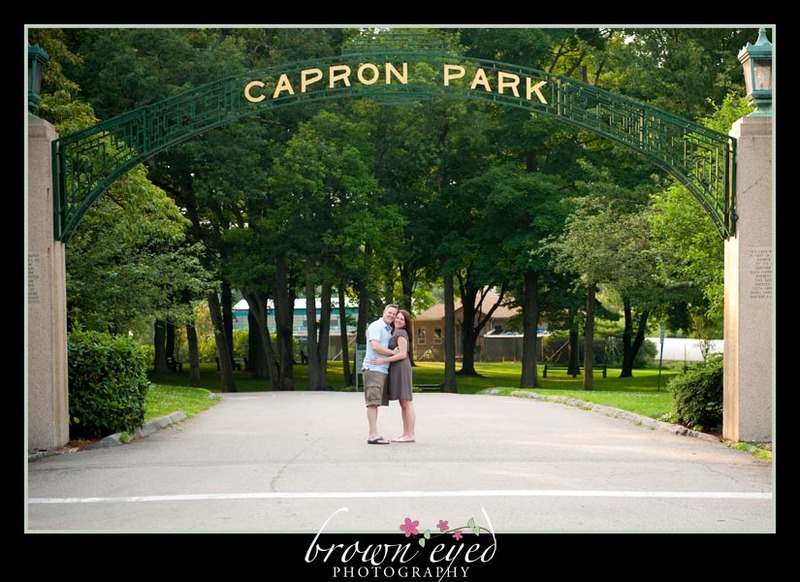 We would pick an awesome location (Capron Park is not short on options!) and I’d hear Eric say: “okay, first we’re going to look at Sarah, and then let’s kiss, and then…” and he mapped it all out and they rocked the shots and I made sure to snag them before the moment passed. Eric’s pretty excited about this ring (rightly so!) and was sure to be on Tracy’s right side as much as possible to show off this stellar ring. I assured him that we’d break out the macro at their wedding and steal their rings for a little while. Their wedding is in 39 days!!! Tracy says she doesn’t do well in the heat (and it was hot hot hot on Sunday during their session). I don’t know if I believe her but just in case we’re hoping for a somewhat cooler day.